I'm wearing the Iron Man Mark VII suit that appears in the final battle of Marvel's blockbuster movie, "The Avengers". 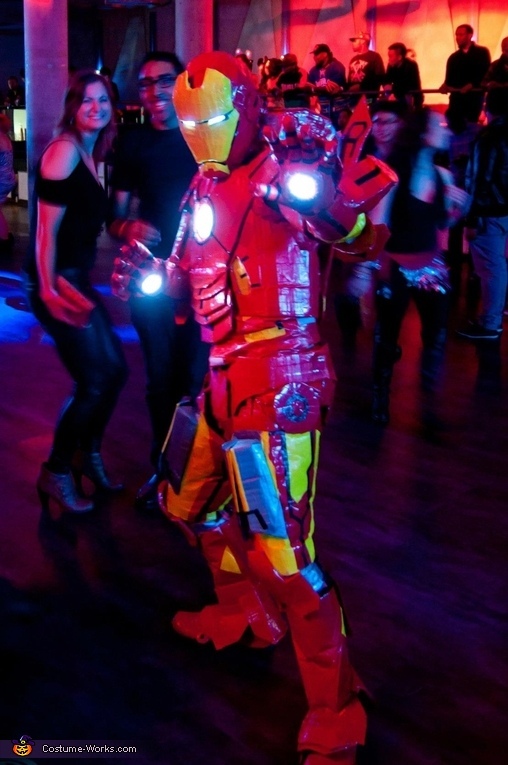 The suit cost around $150.00 to make and is comprised mostly of cardboard and duct tape (with some battery operated touch lights, rubber gloves, Velcro, paper, a plastic bag, and several magnets). A black, long-sleeved shirt and black sweatpants were used as the base under-garment. The costume was built in pieces that were assembled on my body when wearing. I made a replica mannequin of my body and built much of the costume around it (the costume is displayed on this mannequin in a few of the photos). I used magnets in order to clasp much of the armour pieces together, including all of the moving missile doors, rear thrusters, and the visor on the helmet. A few heavier pieces used Velcro to attach the suit directly to the undergarments. Other components were simply worn and stayed on. Dollar store touch lights were used for the chest arch reactor and hand lights (as well as rear thrusters). Switch lights were built into the tri-laser canons mounted on the shoulders, as well as in the eyes of the helmet (directional visors blocked the light from entering the mask so I could see while wearing it, though in a narrow field of vision). Small cap lights (for the brim of a ball cap) were mounted above each wrist to replicate lasers. The costume was incredibly hot as the duct tape acts as an insulator. Definitely not the type of thing to wear for more than a few hours.